The Color of Money should be required reading. 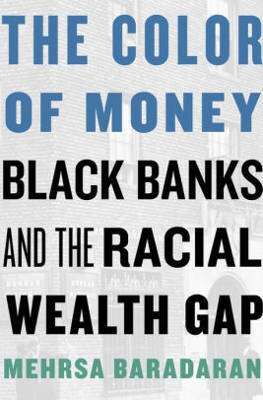 Certainly, for anyone in economics, social justice, or who really wants to understand the mechanisms of money in America, particularly for black Americans. Often we forget — especially those of us born in the “colorblind” 1980s and 90s — that the United States is a young country. Slavery, the Civil War, and Reconstruction (and its failure) aren’t ancient history. Jim Crow and the 1960s Civil Rights movement were basically yesterday. And that all those things have lead to mass incarceration, extreme poverty, and broken economic systems of today. What Baradaran’s book does is connect all these things together through money and formalizing of banking. Though the advent of the American economy — slavery — through how the economy operates up to the recent Recession. She breaks down assumptions and failed methods (both ones with good intentions and bad intentions) to build black wealth with cold, hard facts.